Posted on June 14, 2018 at 7:09 pm. Using on/off turns, chop fresh basil leaves finely in processor. Add ricotta, mozzarella, Parmesan, egg, 1/2 teaspoon salt and 1/4 teaspoon pepper. Using on/off turns, process filling until just blended and texture is still chunky. Preheat oven to 375°F. Spread 1 1/4 cups sauce in 13x9x2-inch glass baking dish. Arrange 3 noodles on sauce. Drop 1 1/2 cups filling over noodles, then spread evenly to cover. Sprinkle with 3/4 cup mozzarella cheese and 1/4 cup Parmesan cheese. Repeat layering of sauce, noodles, filling and cheeses 2 more times. Top with remaining 3 noodles. Spoon remaining sauce atop noodles. Sprinkle with remaining cheeses. Spray large piece of foil with nonstick olive oil spray. Cover lasagna with foil, sprayed side down. 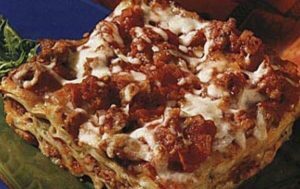 Bake lasagna 40 minutes. Carefully uncover. Increase oven temperature to 400°F. 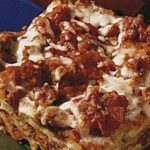 Bake until noodles are tender, sauce bubbles thickly and edges of lasagna are golden and puffed, about 20 minutes. Transfer to work surface; let stand 15 minutes before serving. Can be GF with GF noodles.